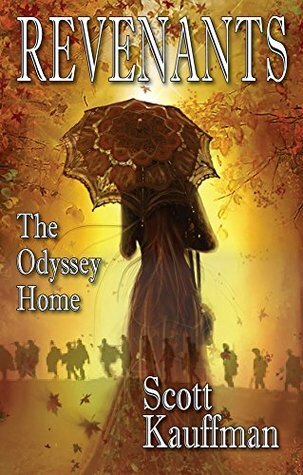 Meet Betsy, the teenage protagonist of Scott Kauffman’s novel Revenants: The Odyssey Home. In the era of the Vietnam War and the turmoil that went along with those days, Betsy is deeply grieving the death of her older brother, Nate, who has lost his life while serving in Vietnam. Betsy goes into a tailspin of depression, acting in ways she knows Nate would never approve of. Hoping to shake her grief, stay out of trouble, and get some meaning to her life, Betsy volunteers at the local VA hospital. Everyday she is dealing with patients who have witnessed atrocities she can only imagine and dares not think what her brother may have witnessed. One of these patients is an elderly man, near death, who served in World War I, “The Great War,” as if war can be considered “great.” This gentleman has one wish, to go home to be with his family before he dies. Betsy decides it is to be her mission to get this man back to his family before he dies even though she knows so little about him. He is a true mystery. However, Betsy isn’t the only one who is interested in this man. So is a crooked politician, Congressman Hanna, who has a great deal of control of this hospital and the small-town in which it is located. Congressman Hanna knows this dying patient’s name and if this man’s name is revealed, Hanna can pretty much say good-bye to his political career and his long marriage. Betsy is not alone on this odyssey. One person who supports Betsy is her younger brother Bartholomew who shares her grief over the loss of Nate and offers her encouragement. And then there is aspiring newspaper reporter, Matt, who knows getting this scoop on this elderly veteran and how he is connected to Congressman Hanna would be a definite career change. However, he is there to help Betsy not use her. Throughout the novel there are twists and turns as Betsy, along with Matt, learns more and more about what about this old man and how it infuriates Congressman Hanna. And there are times when Betsy feels the wrath of Hanna and wonders how it will affect her in the long run. Betsy and Matt’s relationship grows from one that at first strictly professional but soon grows to be a friendship (which a times hints at the romantic). Interspersed throughout the novel are scenes of Betsy working with other veterans at the hospital and chapters devoted to the elderly veteran what he went through during World War I that were quite chilling indeed. These chapters really got into the crux of what war can do to one singular human being. And Nate’s letters home to Betsy are also a welcome addition. Sure, he’s a teasing older brother but he is also loving and kind towards his little sister. At the end Revenants, things don’t go exactly as planned and things don’t get wrapped up in a pretty bow. But Betsy does learn one great lesson. She has more power than she originally thinks and if she realizes it she can use these powers to help others as well as herself. She does a lot of growing up during this journey. For the most part I liked Revenants. Betsy is a heroine who is realistic, at turns a rebellious teen and at others an incredibly brave young woman. Matt is a wonderful support system and I admire his tenacity in getting this important news story together using good old-fashioned gumshoe journalistic tactics (especially in our age of clickbait and “fake news”). As for Congressman Hanna? Well, he is no mustache twirling villain, just sleazy and corrupt. I must admit I rather liked how Hanna was so threatened by a teenage girl and a cub reporter. I do have a few issues. At times I forgot about Bartholomew and it was odd how Nate’s letters to Betsy there was nary a mention of Bartholomew. But these issues are minor. For the most part I found The Revenants to be a very relevant novel, and even timeless in the year 2018 when it comes to war, politics, journalism, the plight of our veterans and people’s desire to make a difference.